The 9pc Skylar baby bedding collection by Sweet Jojo Designs will create a stunning boutique setting for your nursery. This bright and bold designer girl crib bedding set uses a sensational collection of exclusive 100% Cotton fabrics. It combines a chic gray and white damask, a coordinating candy pink and white polka dot, and solid turquoise cotton. The dazzling color palette of candy pink, turquoise blue, gray and white will set your nursery up in high style. This Sweet Jojo Designs set will fit all standard cribs and toddler beds and is machine washable for easy care and repeated use. The blanket is designed using the stylish gray and white damask on the front and the pink polka dot on the back. It is finished with turquoise piping and a cute polka dot ruffle. The crib bumper is also created using the gray and white damask on both sides with a polka dot ruffle. It is finished with turquoise upper and lower ties. The pink and white polka dot coordinating crib sheet is 100% cotton for ease, comfort, and repeated use. This set comes with (2) rod pocket window valances. These valances are made with the gray and white damask and finished with turquoise piping and a cute polka dot ruffle. 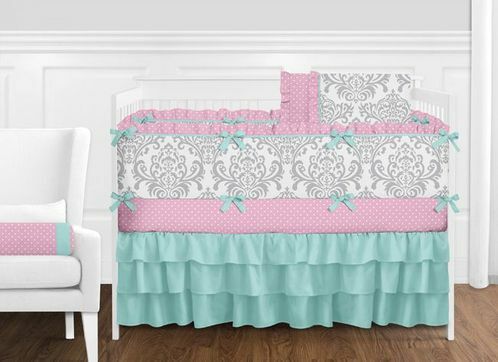 The three tiered boutique style crib skirt is created with coordinating turquoise cotton. The OH SO CUTE toy bag is a definite bonus. This toy bag is great for holding toys, bottles, stuffed animals, etc. It can be easily hung by its own sets of ties. The decorative bolster pillow uses the pink and white polka dot fabric and turquoise trims. What a charming finish to this adorable set!